A few years ago, on a road trip from Montana to Oregon via the Olympic Peninsula, I hiked to Cape Flattery, a wave-crashed cliff on the very northwest tip of the continental U.S. Cape Flattery lies on the edge of the Makah Reservation, a tribe famous for hunting humpback and gray whales from wooden canoes. Before heading to the trail, I stopped at the Makah Cultural Museum to see some relics from the tribe’s whaling heydays and get a recreational permit to hike the Cape Trail. The woman working at the museum that day was also named Mary and we talked at length . She was proud and open and meeting her was one of the highlights of that road trip. Wiser words have never been spoken. 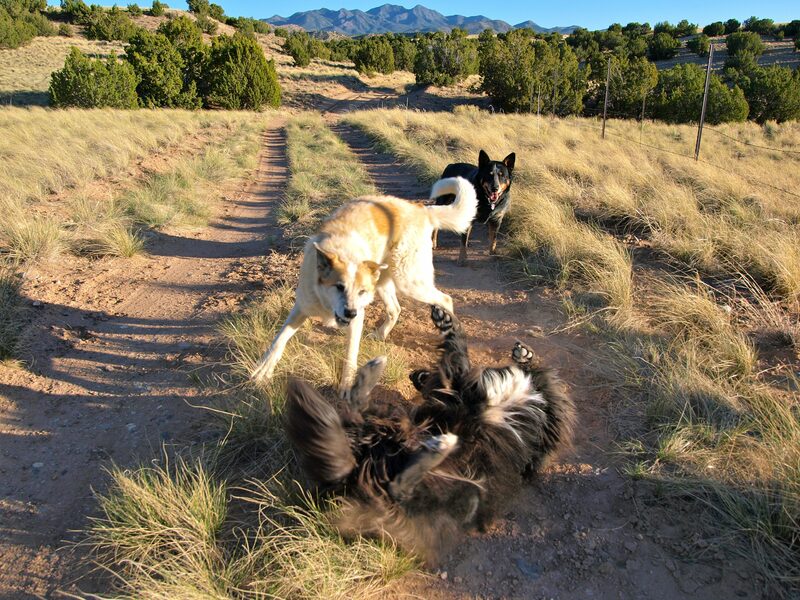 Here in New Mexico, I often hike with a pack of dogs. I have my two and I often run doggy daycare for a third and my neighbors’ dogs also occasionally join us on our walks, giving me 5 or 6 large canine hiking companions. 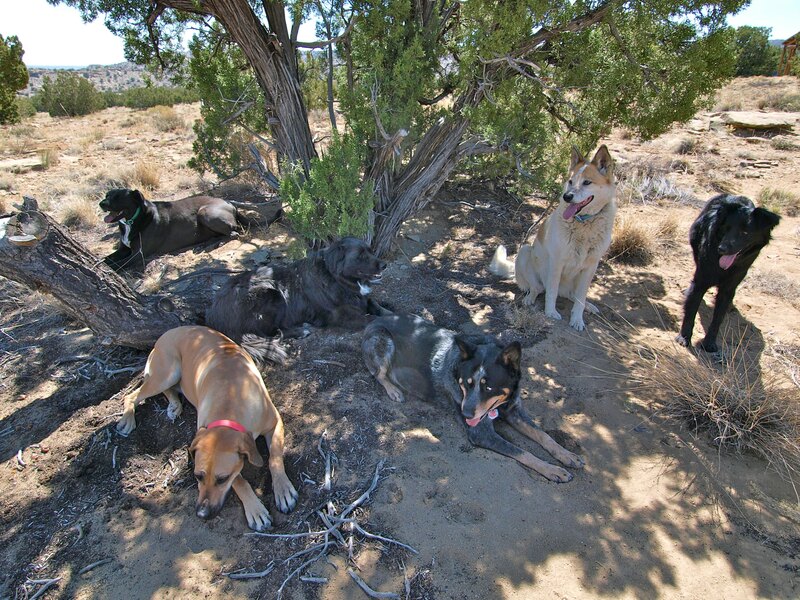 These dogs and I have hiked many miles in this desert together. We’ve crossed paths with cattle, horses, coyotes, rattlesnakes, tarantulas, jackrabbits and a whole herd of goats and never once have I had cause to put any of them on a leash. Dogs like these are rare in the world. They’re not so much pets as my partners. You can’t train dogs like these. You have to travel with them. Dogs evolved to travel alongside people; walking over the Earth with a dog brings out something instinctive in both of you. You become a leader, clear, calm and capable and they become your allies, obedient, loyal and willing to follow you to the ends of the Earth, no matter what you might encounter on the way. I don’t tell these dogs what to do. They know what to do. We’ll hike for hours and never once will I give any of them a command. It’s too quiet out here to yell and I rarely whistle. If my dogs are out of sight, all I need to do to get them back is stop walking. 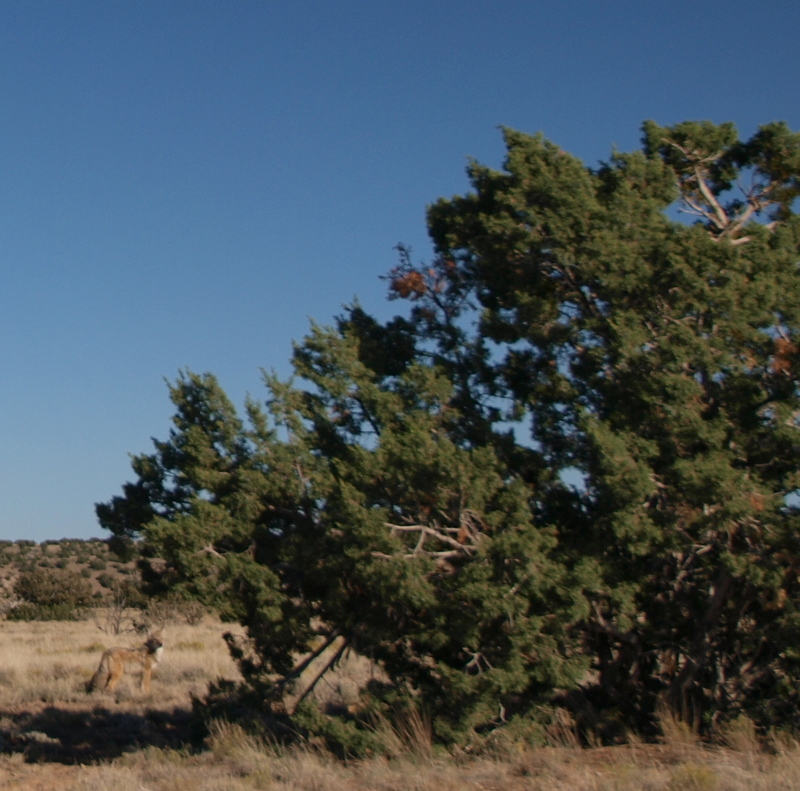 If I stand still for more than a minute or two, they will come running, even the deaf coyote. If I sit down to rest, they’ll all go lay in the closest shade, waiting patiently to see where we’ll go next. Even at rest, I’m always watching for movement. There’s a lot of life in the world, even in the desert. It’s amazing how a few extra vertical feet of height helps me spot movement before the dogs and if I spot an animal first, it’s mine and they won’t go after it. My dogs have all learned their large animal lessons and know better than to chase anything big enough to turn the tables and chase them back. Occasionally, somebody will light out after a flushing jackrabbit, but the dogs have little chance. I let them go and watch them run and revel in the spirit of the chase. New dogs joining our pack catch on almost immediately. Sometimes, I dog-sit a Bernese mountain dog named Trinity who was abused and has a tendency to cower from people, other dogs and anything that moves or makes noise. After a few hikes with the pack, however, she’s a different dog. Her head and tail are up, she runs off on her own, exploring the world and comes right back with the other dogs when I stop to rest. Hiking in all this open space frees her from her anxieties. Out here, the world is a good place to be a dog. My latest regular charge is Bruce, a charming boy with bright blue eyes that look right into my soul. He must like what he sees because sweet Brucie has fallen hard for me. He follows me anywhere and everywhere, trotting at my heels, away from his heartbroken human, without so much a backwards glance. Bruce has decided he’s on Team Mary. Never underestimate the allure of an enchanting pack leader. 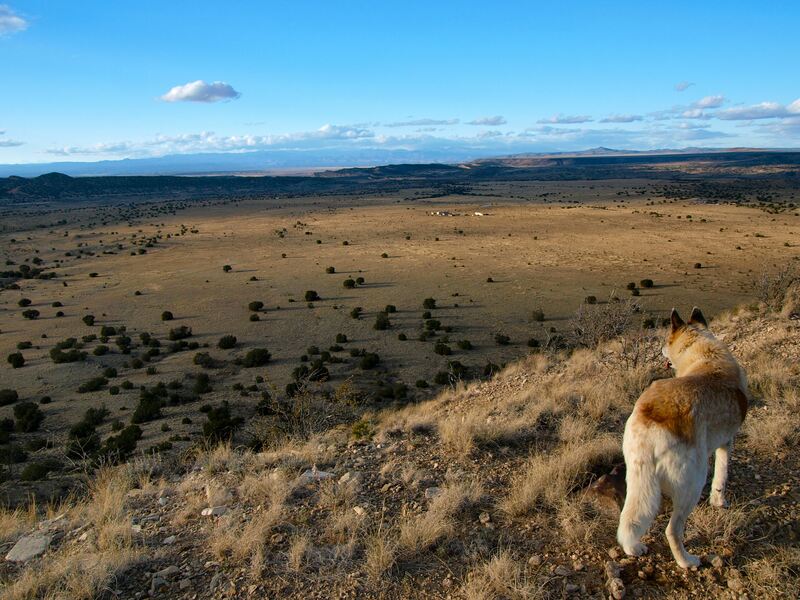 Even surrounded by half a dozen desert dogs, I’ve been missing Freckles, my Blonde Coyote hybrid, who was the wildest of them all. On our walks, she would sometimes disappear for an hour at a time. I usually had no idea where she was, but she was always aware of me and would come back if I stopped to rest. In all our wanderings, I only lost her once. I found her, ecstatic, waiting for me at home. Now that Freckles is gone, the wild girl role has been swept up by Bruce’s funny little greyhound girlfriend, Arie. At rest, she’s a weird looking dog, but in motion she makes perfect sense: the beast is built to move. Arie runs like a wild thing. In her, the Blonde Coyote lives on. Here’s to all good dogs who run free. Freckles & her Big Backyard. You could drop this dog off anywhere out here and she’d find her way home, no problem. 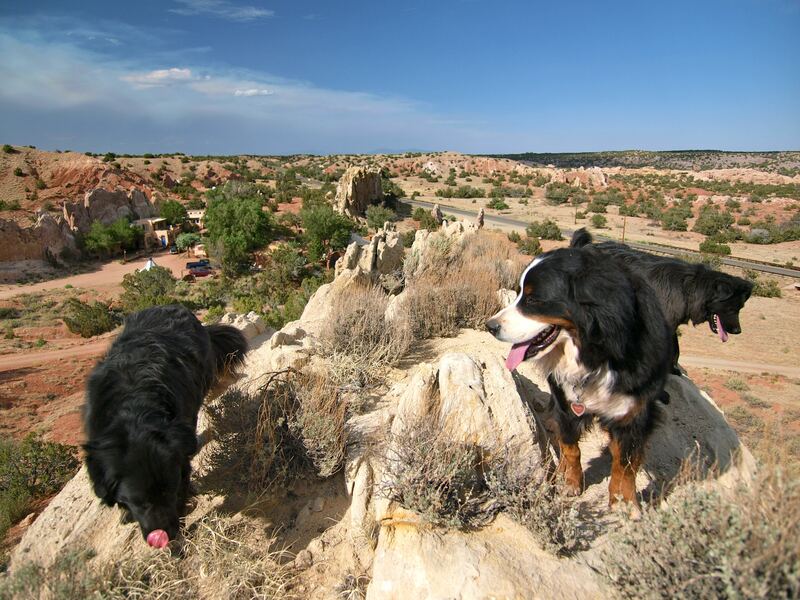 This entry was posted in Bowie & D.O.G., Hiking!, New Mexico, Photography, Road tripping!, Sustainable Living, Vagabonding 101 and tagged dogs, hiking, off leash. Bookmark the permalink. This is an absolutely wonderful post Mary. Thankyou so much! How wonderful that you are blessed with the understanding of animals .You are very proud of your dogs and in return they respect you. How can anyone be cruel to any animals is beyond me. Love this post Mary thanks for sharing. Love your blog and your dogs. I live an hour outside NYC, and so wish I could let Lu run free. I think she was raised a desert dog. Reblogged this on the PEAK OXperience. I so enjoyed this post. My favorite photo is the one with the dogs watching the raven, but all the photos are beautiful. It’s so difficult when we lose one of our beloved four-legged family members…..special creatures. I so enjoyed this post, Mary! I feel the same when hiking with my soul-dog 🙂 — we have that unspoken communication as we travel the trails. near the Crest. It starts at the Doc Long picnic ground and winds up toward the Crest ( I believe the trails are the corredor trail and the tree spring trail). You should check it out if your down this way. We are currently exploring southern Arizona, and sadly, my woodland raised Lab/Hound mix is only slowly learning the danger of walking by scent among the cacti. I routinely pluck needles from his snout. But he has been walked off leash all his seven years and to leash him does indeed harness his spirit. I am hoping he learns to use his eyes more than his nose sooner than later. Perhaps hounds do not make good desert dogs. beautiful, they always appreciate a walk in nature. My dog is more a forest dog. That might be because we like in Minnesota, so no deserts. But he loves the space and the freedom to run. He does chase animals and catches half of them, but he never hurts them. More surprised that they won’t play back after he catches them. Beautiful post that expresses the at once wild and loyal spirit of dogs. There are no greater adventure buddies than canines. They’ll follow you to the ends of the Earth and back, over any terrain and into the most unknown landscapes. The thing that thrills me unlike anything else is to watch a dog when he is free, running unleashed in the vast expanse of wilderness, reveling in his freedom, yet still checking in frequently with his human. Whether it is a quick glance over his shoulder, or a nose to the air, catching the sent of his beloved master on the wind, they are always aware, and always devoted, even when running wild. Great post. 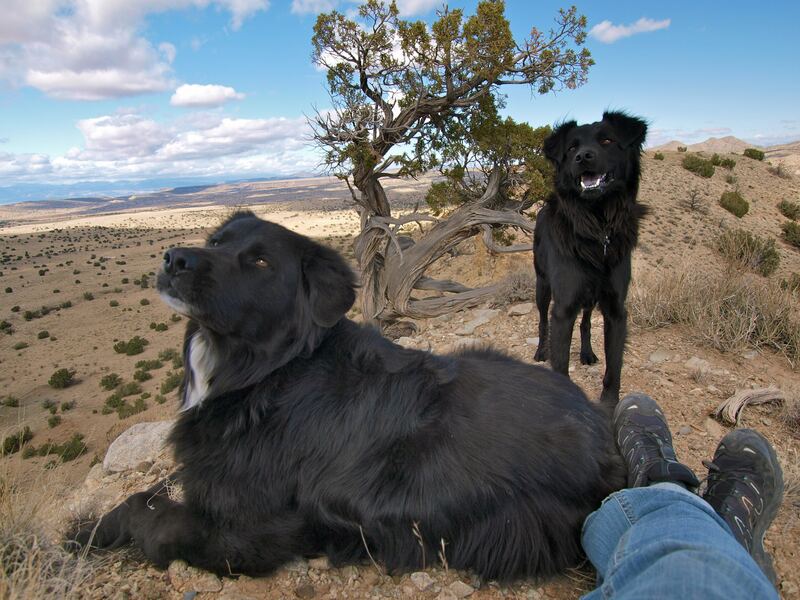 I live in NM and can’t go a weekend without getting my dogs out to hike and roam. As soon as I poor a cup of coffee in the a.m. the dogs are on me to get going! We all love every minute of it, each and every time. Thanks for sharing your unique experiences on the trail with your pack. Very cool! And great photos.